I have a dear friend, Lynn, who lives about 1400 miles away. We lived near each other for many years until my husband and I moved to Florida. We have been friends for over 30 years, and neither us of would be thrilled to have anyone calculate our ages from this post! When we lived close to one another we shared time together enjoying many interests including quilting, antiquing, and most importantly, gardening. Lynn has impeccable taste. I trust her opinion, and when I visit her each summer I feel so relaxed and nurtured in her gardens and home. Each year she works endlessly improving her gardens adding charm and functionality. Last year she added a little shed made of old windows and barn wood. Her brothers, son, and dad helped in its construction and it now houses hanging herbs and important garden tools. In front she has constructed a small patio of reclaimed slate paving stones that might have otherwise lost their usefulness as they were being thrown away. She also has a small log cabin playhouse that her father built for her when she was a little girl. It was moved to her home a few summers ago on a flat bed truck and now sits under a shade tree in her charming backyard. Lynn was probably the person who first introduced me to fairy gardening and miniatures, although I can’t remember the exact moment. She has such an artistic eye for putting things together. Here is one of her container gardens. 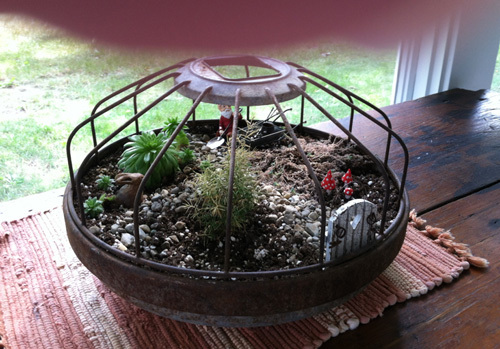 It is a re-purposed chicken feeder that is home to a tiny little gnome, a wheel barrow with tiny tools, a welcoming garden gate, small scale plants and a tiny stone garden path. Her visions inspire me and I can’t wait to visit her again this year to see what new delights I will find in her home and her backyard over a glass of iced tea. You can find lots of inspiration for fairy gardening on Instagram, Pinterest, blog posts, garden centers, and on etsy.com. Visit my Pinterest-Tiny Gardens board and search other boards as well to find photos and fairy garden how-to’s.